Fleet Graphics Get Attention | Mark Your Space | Chicago Area Sign Co.
Mark Your Space helps you reach more customers. Mark Your Space recently completed a fleet graphics project for American Lawn & Landscape Co. Their large trucks were ideal for active brand promotion. Now, as this top landscaping agency moves around tending to Chicago area lawns and gardens, their colorful fleet graphics are advertising non-stop. Want to take advantage of your fleet to promote your business? Then contact us or give us a call at (630) 289-7082 today. American Lawn & Landscape Co. is a full service professional landscaping agency, and they service lawns up to 16,000 square feet. The attractive orange, green and white color scheme on these trucks is sure to draw attention - not to mention their prominently displayed, catchy website address (JustMowNGo.com). Mark Your Space outfitted three trucks for American Lawn & Landscape. This is fleet advertising at its best - a big space, excellent graphics and creative presentation. Vehicle wraps are a great way to take advantage of an advertising space you already own - the surface area covering your vehicles. Deciding on your fleet advertising scheme is more than just putting up some fancy pictures. You want to make sure all your marketing efforts are in line. For example, American Lawn & Landscape has built an entire campaign around the “Mow & Go” theme. This service helps homeowners be sure that their lawn will be taken care of on a routine basis. 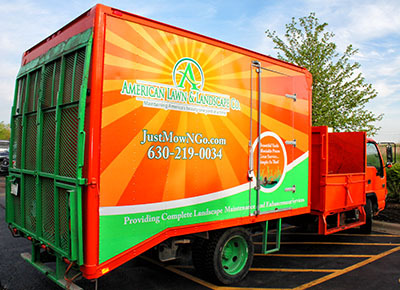 Now when people see the bright orange trucks around town, they think, “Mow & Go.” And when they visit the American Lawn website they encounter the same branding theme. This consistency encourages trust which is the cornerstone of good business. Even though a business might have an idea of what they want for their fleet graphics, seeing actual draft examples makes a big difference. It pays to compare concepts to decide what makes the most sense for your brand image. After the final design is chosen, digital printing allows for rapid task completion. In a short period of time, we were able to outfit the American Lawn trucks with a brand new skin. The finish is just as important as a clear, sharp image. We choose 3M since it’s the leading wrap material and laminate finish provider. Mark Your Space uses 3M products exclusively on all our projects, and all our wraps all come with a 7 year warranty. Application of the wraps must be done in an environmentally controlled setting to avoid temperature induced distortion or cracking. Any dust or air under the wrap can cause bubbling or a bumpy texture so careful application is essential. The end result is a beautiful and creative way to promote your business. Have your fleet work double-time with vibrant car or truck graphics from Mark Your Space. Contact us or give us a call at (630) 289-7082 now.